Mexican Hot Chocolate recipe by Nazia Nazar at PakiRecipes.com. 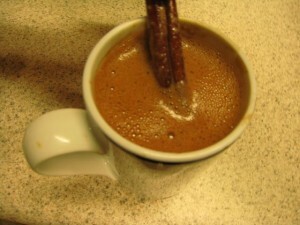 A rich hot chocolate that is spiced up with cinnamon and chocolate. Combine evaporated milk, water, orange rind, cinnamon and cloves. Bring to boil. Remove from heat. Let stand for 10 min to infuse flavor. Strain the milk. Discard orange rind, cinnamon and clove . Bring the strained milk to boil. Remove from heat.